The Uutak Mythos (pronounced [u:ta:kʰ], so it sounds similar to the phrases "You Talk" or "Ooh Talk") is a popular and extensive community-created project centered around the island of Yneslea in the lore of the Elder Scrolls universe. It was founded by LaJaveyon Saunders (known as IceFireWarden in most Elder Scrolls communities, except for Reddit and Tamriel Foundry, where he now goes by the username Al-Hatoor), a prominent member of the lore community, with the help of former Bethesda developer Michael Kirkbride in February 2014. In early February 2014, IceFireWarden had the idea to create a world-building project centered around a sparsely developed place in the lore of the games. In his own words, he originally settled on the strange idea of bat-elves because he thought "making a Batman joke in TES would be funny". He went on to contact Michael Kirkbride, who had worked on the development team in the past and still did some contract work occasionally for the games, to help in this endeavor. Kirkbride gave him tips, advice, and much needed direction in regards to the project and eventually IceFireWarden started posting some pieces (originally just titled 'Uutak') on Reddit to largely negative reviews, mostly due to the esoteric and confusing nature of the pieces. Slightly discouraged, IceFireWarden slowed down writing the Uutak pieces and began to work giving the project its own unique tone and individuality. When C0DA was released to the public later on in that same month, Warden and Kirkbride created a small, entertaining joke comic centered around the early incarnation of Echmer and their god-hero Hrahndeyl invading Jubal and Vivec's Amaranth (with the caption "I AM THE NIGHT") and posted it on the original Bethesda Game Studios Forum discussion for the out-of-game work as the 'first' piece to demonstrate the true nature and purpose of C0DA. This stunt of course caused the world-building project to receive much more negativity in the community, but ironically renewed it at the same time. After three years of continued development (and with the support of friends and fellow community members, who created lore, concept art, music, and maps to support the project), the Uutak Mythos rose in popularity and had attained something of a cult status in the TES community. In an ask me anything segment conducted by the writers of ZOS, Loremaster Lawrence Schick even described the Echmer theory as "a lot of fun", even though he wasn't quite sure where they could use it in The Elder Scrolls Online. Despite this, ESO may or may not have a few not-so-noticeable shout-outs to the Uutak Mythos that can be found in the game (see below). IceFireWarden continues to write about the Uutak Mythos and has no plans on ending the project, although he stated he was surprised to see that it would "grow to be so big". He and a few others are currently working on building a team so they can create a small mod that will give the Echmer a physical portrayal in The Elder Scrolls V: Skyrim as a goal, after the previous two attempts at doing so failed. As stated above, the Uutak Mythos expands upon the lore of the island kingdom of Yneslea described in the books Disaster at Ionith and Brief History of the Empire, of which practically nothing is known about. It follows the stories of the Echmer and their god-hero Hrahndeyl, whose dealings and conflict with the denizens of Tamriel, the other natives of their homeland, and the warlike races of the continent of Akavir. The Ynesleaic Archipelago officially consists of seventy-two landmasses that were conquered by the Echmer during the First Era, but only eight are considered under the true authority of the Echmeri Directorate. The two largest islands of Yne and Slea (which were condensed into 'Yneslea' by Uriel Septim V as a name for the entire archipelago) are the ancestral homes of the bat elves and are where their vast underground cities are partially located. The other five islands of Morubixaba, Pasgaviati, Elysia, and Hrahn's Isles (which consists of three small islands) are less strategically important, but are home to notable settlements that are considered valuable to the Echmeri as a whole. The archipelago itself lies in-between the Starry Heart and the Dragon Land within the Padomaic Ocean, the largest body of water on Nirn. Sailors of all races have noted that the waves are always in a state of turmoil and are dangerous to navigate, being host to whirlpools and deadly sea creatures. Although the Echmer have never been particularly interested in voyaging too far from their lands, they have also admitted that the majority of the reasoning behind this decision stems from the deadly waters that surround them. According to Echmer scholars, the reason why the waters surrounding Yneslea are so anarchic is because their Protoechi ancestors imprisoned a powerful spirit within the Dweech in ancient times, and its rage bestows mystical properties to the seawater. Although this has never been proven, the seas do seem to contain some otherworldly element that confuses both natives and foreigners alike. Hagreger the Calm, the most famous Echmer seafarer to have ever lived, was the first individual to sail the waves around Yneslea and named the three bodies of water that surrounded the archipelago: the Bitter Sea, the Chaotic Sea, and the Channel of Tru'Gitet. The Bitter Sea is the expanse of water that surrounds Yneslea to the north and west, and is filled with jagged rocks (resulting in the natives giving it the ill nickname "The Bites") and perpetual thunderstorms. It meets the Chaotic Sea to the south and east. According to his preserved journals, Hagreger came up with the name due to the taste of the water and the intensely cold winds that swept through the area. In more northern areas, icebergs are common alongside a fine frozen mist. The Chaotic Sea to the south and east is considered much more dangerous than the Bites due to its powerful whirlpools and abundance of violent sea beasts. Because of the volcanic activity of the small islands located within it, the Chaotic is considerably hotter than the Bites and is covered with a thick haze. Because of this haze, Akaviri forces are sometimes able to sneak up on the Yneslean archipelago, something the Echmer have always hated. Hagreger's journals state that the seafarer got lost in the Chaotic for a considerable amount of time, and was badly burned when a volcano erupted and set fire to his ship. Where the two seas meet between the islands of Yne and Slea lies the Channel of Tru'Gitet ("Channel of Gentle Winds"), the only calm waters in the Yneslean archipelago. Ships sailing from the eastern coast of Yne to the western coast of Slea (and vice versa) are able to conduct their business safely and effectively with little to no issue besides from Brigands operating on the open water and underwater creatures. Xenophobic and isolationist, the Echmer are perhaps the most confounding non-Tamrielic race the Empire of Tamriel has ever encountered. Technologically advanced and culturally scholastic, they once served as the chief advisers on all Dwarven and mechanical matters during their time as citizens underneath the Septim Dynasty. But after serving 364 years as an Imperial territory, they once again became socially independent, returning to the governance of their native authority – the Council of Dull Chimes – in the 10th year of the Fourth Era. As of 4E 201, the Echmer try to maintain a strict distance from the Starry Heart, and prefer to ignore the ongoing hostilities between the Mede Dynasty of Emperors and the Third Aldmeri Dominion; whether this is because they wish to maintain an apathetic neutrality in international affairs or because they have their own ulterior motives in regards to Tamriel remains to be seen. The Echmer ([ɛkmɜ:] in pronunciation) – which can be translated into the Echo Elves, the Echo Folk, or the People of Echoes – are a race of bat-like beastfolk that are the chief inhabitants of the islands known collectively as Yneslea, which are located in the Padomaic Ocean. A major misconception (as well as a topic of much debate among Tamrielic and Yneslean scholars) is that the Echmer are literally elves; this is not true, or at least not in the conventional sense. A shy, prideful, loyal, factual, astute, and intelligent people (yet also an aloof, magnephobic, pessimistic, world-weary, and sardonic race), they are the most dominant of the three prominent species that live in the archipelago, the other two being the Hyu-Ket – a race of insectoid goblins the Echmer have a troubled past with – and the Terenjoe – an enigmatic subterranean shark-like people. A 'fourth' race also lives in Yneslea, the savage hairy frog-men known as the Broh-Kah, but their primitive and tribalistic lifestyle that centers largely around banditry causes the Echmer to define them as monsters rather than an actual race. Once, the Echmer viewed all foreigners as hostile intruders that must be removed from their domain; now their collective demeanor is only slightly as icy as a mountaintop in Skyrim due to their rather recent involvement with the continent of Tamriel. 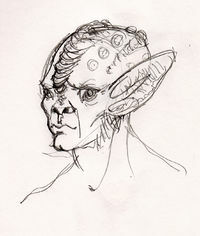 The racial name for the Echmer uses words from the Dwemeri (and therefore Aldmeri) language, which they would later modify to form their native tongue of Echi. In Aldmeri the word 'ech' can translate into 'mirror', 'trace', or (most importantly) 'echo'. Therefore, the most accepted translations of Echmer are 'Echo Folk', 'Mirror Folk', and 'Trace Folk'. The most symbolic translation is Echo Folk, for in a sense the Echmer are the last living echoes of the Dwarves, having been accidentally created by them and being the race closest to them before their disappearance. When Yneslea was brought under Imperial rule the word 'ech' became synonymous with 'bat' due to the outward appearance of the Echmer, which resulted in them being referred to as the 'Bat Folk' throughout the Empire. Although the Echmer are indeed descended from the ancient bats that once populated the islands, they were at first disillusioned, mortified, and annoyed by this translation. It wasn't until several years passed that they eventually grew used to hearing the title and began to use it themselves with an emotion they still deny to this very day as pride. The Echmer anatomical structure is very distinct when compared to the anatomical structures of the Tamrielic races due to their rather unique origins. Originally the Echmer were normal bats that inhabited the underground cavern systems of Yneslea, but their souls and bodies were mutated by Dwemeri tonal architecture (an obscure yet immensely powerful sound-music magic). Their intelligence and natural growth accelerated at an alarming rate, and when the Dwemer themselves began to view them as sapient beings their souls became black under the Laws of Arkay. All of these factors contributed to their evolution from simpleminded beasts to the merish intellectuals that walk the archipelago in modern times. The standard Echmer individual (male or female) stands at a height range of 5 to 6 feet, and generally weighs around 150 to 300 pounds. They are naturally slim and well-muscled, with greater strength than the actual merish races (the Orcs, or Orsimer, being the sole exception). The skin of an Echmer is a fair caramel, but is covered by a light fur ranging from various shades of brown, grey, white, and black. Echmer do not have hair in the normal sense, but they do stylize and dye their fur in ways similar to Nibenese tattoos. When it comes to hairstyles, most Echmeri have braids, dreadlocks, ponytails, or go bald. The skull still carries many batlike characteristics, and protrudes forwards slightly. Their ears are vaguely merish but much larger and extended, as well as being closer in shape, appearance, and function to the ears of an actual bat, allowing them to hear exceptionally well and pick up sounds that other races can't. They have four-fingered hands with opposable thumbs and four claws on each foot along with a back claw that allows them to hang from ceilings (however, they do this rarely, and prefer sitting in chairs and sleeping in beds like the other races). The Echmer are capable of seeing through the use of both their natural eyes (their normal vision is weaker than the vision of most Tamrielic races, so the majority of the race makes up for it by wearing spectacles) and a biological trait known as echolocation (their 'reflected sounds'). Their eyes are well-adjusted to darkness due to naturally living underground, and since the First Era have grown more accustomed to sunlight. With echolocation, they are able to see things in the dark by sending out 'mental noise' into an area, and having the sounds reflected back to their mind – this results in a black and white afterimage of the area in complete detail. When one combines this echolocation ability with their exceptional hearing, it is considered almost impossible to sneak up on an Echmer. In regards to their natural eyes, the color of their pupils range from different shades of blue, green, red, purple, yellow, black, and white. The most remarkable physical trait of the Echo People are the membranes attached to the undersides of their forearms, remnants of the wings all normal bats have. They do not allow the Echmer to fly, but short-range gliding is possible with them. However, most Echmer have made it a practice to have the membranes removed at birth in a process similar to circumcision, as they are found to be uncomfortable and are rather easy to tear (which leads to an awful disease that can become fatal if not properly treated). Echmeri females and hermaphrodites usually give birth to live young after nine months like the other merish races, birthing one offspring at a time (although twins are somewhat common). A trait unique to the Echmeri reproductive system allows them to stall childbirth for an additional three months in case the predetermined time is not suitable for whatever reason (usually in periods of war and sickness, where one would not want to raise a child). Most Echmer can only have about four children in their lifetime. The typical Echmer lives to about 150 years of age, with their fur becoming silkier as they grow older, but a particularly healthy individual can live to see the ripe age of 250. Echkin, commonly known as giant bats, are a 'mutated' strain of Echmer. During the First Era, the Yokudan God Hoodoc summoned a small army of Echmer soldiers to aid the Ra Gada migrate to Tamriel and defeat the monsters and races that lived in the Deathlands after Yokuda sunk into the sea. The Orcs were able to successfully curse the Echmer warriors, causing them to deform, turn feral, and take up residence in the Wrothgarian Mountains. Eventually, they spread throughout Tamriel and became the giant bats of modern times, with their once-sentient origins becoming nothing more than fanciful legends and folk tales told to children among the Redguards, Bretons, and Orcs outside a few groups. Hrahndeyl (which translates into 'New Sound' from Echi; sometimes capitalized as HRAHNDEYL) is the well-loved god-hero of the Echmeri race, who was born a mortal but became a god after traveling Nirn for twenty years in exile as a young man and attaining a great deal of metaphysical knowledge. He is known as the God of Talk, and his spheres include communication (written, verbal, and mental), sound, individuality, celestial bodies, and to a lesser extent, time (via mortal influence on it). Hrahndeyl's other monikers include the ATEDA of Sound, the Guardian of Constellations, the Breather of Stars, the Forger of Truth, and the Arcane Sage. He is the caretaker of the Black-Welkin, the Echmeri afterlife, and his arch-nemesis is Lyednharh/LYEDNHARH, the God of Silence. Because of his exile, Hrahndeyl is remembered and revered by most of the cultures on Nirn (Harran-Zhirr to the Khajiit, Hran of the Dale for the Bretons, Hoodoc among the Yokudans/Redguards, Al-Hatoor during his time with the Warrior-Poet of Morrowind, and more) in some obscure form or fashion. It was also through the lessons given to him by Vivec and the Hist that motivated him into finding the meaning of his and the world's existence, resulting in his eventual acquiring of CHIM, a form of spiritual enlightenment. He later returned to Yneslea and ascended to the heavens before his people to demonstrate his newfound power and wisdom, and (in an act of love) attuned Echmeri souls to the Void so that they may cease to exist when they die, granting his peoples' wish to no longer be bound by the Aurbic Prison. Hrahndeyl usually manifests in the form of an Echmer male with silver fur and eyes as blue as the sky, wearing four silver, engraved rings symbolizing the Aedra, sixteen golden necklaces for representing the Daedra, and azure robes of the finest silk. He also has a lapis lazuli stone within his forehead that glows with an inner fire, and when angered, he can apparently take on the form of a bat-dragon to engage his enemies and defend his people. Although these have yet to be confirmed (and due to the nature of Easter eggs, probably never will be), there are a couple of possible shout-outs to the world-building project in ESO, the only game to have been released around the same time the Mythos rose in popularity. In the Loremaster's Archives, the use of the word echkin as a synonym for giant bat in some of the questions seems to be accepted and even acknowledged as an alternative name for the species in-universe, although the word itself is never used in the Loremaster's answers to those questions. Also in the Archives, Hoodoc is mentioned in one of the answers. He was mentioned beforehand in another Archive, where he was stated to be an enemy of Demiprince Fa-Nuit-Hen. ESO's Update 6 introduced Contraband items that you can steal in-game, each of which comes with flavor text. Two of them appear to be sneaky references to Echmer: "Framed engraving of the famous scene showing the making of bat-cheese from the long-lost giant dairy bats of Goldfolly." refers to their cream-making, while "A set of ivory spice shakers, in stylized shapes of bat-winged men. Considered to be in poor taste by certain Rivenspire nobles." refers to their appearance. A "Screeching Echkin Tavern" in Ska'vyn was mentioned in two official in-universe interviews conducted with Lawrence Schick (New Life Festival Interview Part 2 and Homestead Interview). The Uutak Mythos Bible: The ultimate encyclopedia of knowledge in regards to the entire Mythos. Contains a timeline, lexicon, details on the Echmeri government, religion, way of life, and much more in a package of over 140 pages and can be downloaded in .pdf format. The Uutak Mythos Bible, Supplementary I: The first update to the UMB, including several of the more well-liked texts and books that build up the world of the Uutak Mythos. Echmer Playable Race Mod at Skyrim Nexus: The official playable Echmer mod for Skyrim. 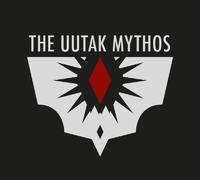 Uutak Mythos Discord: The official Uutak Mythos Discord. Hrahndeyl's Sword-Meeting with Cyrus the Restless: An 'interquel' set between Lord Vivec's Sword-Meeting with Cyrus the Restless and Tiber Septim's Sword-Meeting with Cyrus the Restless, the infamous sellsword embarks on a journey into the Padomaic Ocean at the bequest of a Telvanni and finds more than he bargained for when he attracts the attention of the Echmeri god-hero. Is in the midst of a rewrite, and is also expecting a sequel sometime in the future. Beasts of Tamriel: The Echkin: More information about the echkin, or giant bats, that plague Tamriel and their mysterious origins. Death From A Thousand Cuts: A Memoir On Echmeri Swordsmanship: Written from the perspective of an aging Echmer, this treatise explains the importance of swords in Bat Elf culture and society, as well as revealing the true reason why the fight. Uutak Mythos Conversations I: Aither, an Echmeri Exul, answers questions about his homeland and mentions things not found in any other Uutak work. Al-Hatoor, Spirit of Meaning: A book that goes into great detail about Hrahndeyl and how he rose into godhood from the perspective of an Echmeri vampire, as well as his ties with Vivec and the Dunmer. Considered 'heresy' in the Yneslea archipelago and elsewhere. Uutak C0DA, Issue 1 of 1: Taking place during MK's C0DA, it follows Inati, an Echmer High Hypothesian whose travels with Hrahndeyl in the Post-Landfall Aurbis groom him into becoming a true leader of the Echmeri people and discovering the beauty and meaning of existence. Reading any other material (as well as the ability to understand some esoteric things) is definitely required before attempting to read this piece. Landfall Day Zyr: A community project that also takes place in Post-Landfall Aurbis. It follows the perspectives of different individuals who are related in some way to an enigmatic group of soldiers known as Ghost Choir 9. One of the characters is Anubis, an Echmer God-Killer who travels with a Khajiit warrior-prophet named Ra'zhiin in order to kill GC9 and 'save' his daughter in the short stories Road to Hell and Doors of Heaven. Warning: very morbid and dark, with a lot of esoteric concepts. Official Uutak Mythos Soundtrack: Music inspired by the Echmer and Yneslea, created by the artist Seyda Neen for the Uutak Mythos mod.